Microsoft SQL Server Express LocalDB is intended for developers, it is very easy to install and doesn’t require any complex configuration task to create an instance or to use the database. The Introduction on the installation of Local DB be found on “How to install Microsoft SQL Server Express LocalDB” article. This article will show different ways of connecting to LocalDB and how to create and use an instance of LocalDB. LocalDB runs on demand, which means that the LocalDB processes can start and be stopped automatically when needed. In practice, this will happen when a computer is started and there is no LocalDB process running. So, there are no resources dedicated to servicing a database server during one’s daily work routine. When an application that uses Microsoft SQL Server Express LocalDB is run and a connection is made to the database, the LocalDB process is started on the computer aka on-demand. When the last connection from the application is closed, after a short delay, then the LocalDB process ends. Also, the attached database file name property can be used for the database connection string. In this way, the location of the database file can be controlled. The database file doesn’t have to be searched in some centralized SQL Server location, but it can be found in user’s Application Install folder. This means that the work is only being done with a database file, not with configuring and using a database server. The v11.0 and MSSQLLocalDB instances are automatic Microsoft SQL Server Express LocalDB instances and come with installation of Microsoft SQL Server Express LocalDB. Depending on which version of Microsoft SQL Server Express LocalDB is installed on the machine, the different automatic LocalDB instance will appear. For example, if only Microsoft SQL Server 2012 Express LocalDB is installed, when the available LocalDB instances on a machine using the SqlLocalDb info command are listed, the v11.0 LocalDB instance will appear. But, if Microsoft SQL Server 2014 Express LocalDB or a newer one is installed, the MSSQLLocalDB instance will appear as the automatic instance. Naming conventions of the automatic v11. 0 LocalDB instance can be taken from this link and naming conventions for the automatic MSSQLLocalDB LocalDB instance can be found on this link. Shared name shares the instance using the specified shared name, when multiple users need to connect to a single instance of Microsoft SQL Server Express LocalDB. Private LocalDB instance “v11.0” shared with the shared name: “Mare”. Administrator privileges are required in order to execute this operation. Auto-create indicates (shows) if LocalDB instance automatic is created or not. If the LocalDB instance is automatically created in the Auto-create section, Yes will appear. On the other hand, No will be shown. LocalDB instance “NewInstance” created with version 13.0.2186.6. As it may be noticed, the version of the NewInstance LocalDB is different from the version of the v11.0 LocaDB instance. This happens, when on a machine, more than one version of Microsoft SQL Server Express LocalDB have been installed. Now, when a new instance of LocalDB is created without specifying a version of Microsoft SQL Server Express LocalDB after a name of the LocalDB instance in the creating strings, by default, the higher version of the LocalDB will be used in creating the process of a new LocalDB instance. LocalDB instance “Test” created with version 11.0.2318.0. The parameter for the LocalDB Instance API method is incorrect. Consult the API documentation. LocalDB instance “Test instance” created with version 11.0. Now, the State is changed to “Running” and the Instance pipe name section has a value. This value (string) is used as the connection string to the Test LocalDB instance from another application. 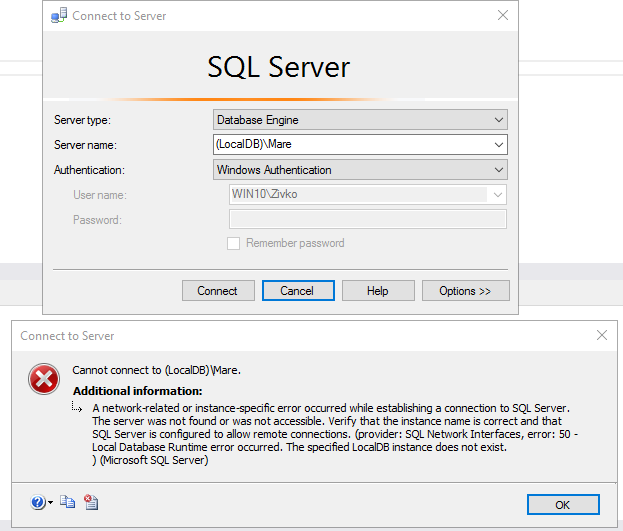 Now, when an instance is created and started, it is not possible to do other things like creating databases and running queries since SqlLocalDb does not provide an interface to the engine by itself as it does not provide a means to interact with databases. Still, there are several other options to connect to and interact with SqlLocalDb instances. Now, when the connection is established, the same T-SQL code can be used in LocalDB as it is in SQL Server Express when creating databases, tables, stored procedures etc. There are some restrictions related to LocalDB comparing to SQL Server Express, which can be seen here. This type of connection to the automatic LocalDB instance refers to Microsoft SQL Server Express 2014 LocalDB or newer. As it is mentioned in the text above, if more than one LocalDB versions are installed on the machine, the connection will be established with the automatic LocalDB instance with higher (latest) version. Requested operation on LocalDB instance cannot be performed because specified instance is currently in use. Stop the instance and try again. Also, type the following command: sqlcmd-S (localDB)\v11.0 in order to connect to v11.0 LocaDB instance. LocalDB: Where is My Database? Marko is a Mechanical engineer, who likes to play basketball, foosball (table-soccer) and listen to rock music. He is interested in SQL code, PHP development, HTML and CSS techniques. Currently working for ApexSQL LLC as a Software Sales Engineer, he is helping customers with any technical issues and does quality assurance for ApexSQL Complete, ApexSQL Refactor and ApexSQL Search free add-ins.